fan fic misses the whole point. Labels: battle of the five armies, Haiku, hobbit, Ian McKellen, movie review, peter jackson, Tolkien, wtf? So, you didn't like it? I have to confess disappointment in this movie, and the series as a whole. While I'm not strongly tied to the idea that the movie has to be true to the book, and I'm open-minded enough to allow a director the artistic license to tell their own story based on the framework of another one, I was honestly bored by this movie. Jackson threw away the charm and wit of the original story, and replaced it with CGI and tedium. Agreed. Movies and books are different media and will never be the same even if drawn from the same source. In screenwriting, we were always taught the art of adaptation is a "smash and grab", taking the best moments and just making sure the rest stays as true as possible to the original spirit of the thing. I believe Jackson's version of the Fellowship of the Ring was a good adaptation in this regard. Changes were made but with good reason and they were well thought out and successful (on the whole). However, over the course of all six PJ/Wingnut films, there is a definite trend of the adapter inserting himself more and more into the finished work and the narrative, forgoing the magic and beauty of the original stories in favor of extended fight scenes and sitcom-quality humor. As a result, each one has been progressively less true to the source, and, in my opinion, each has gotten progressively less watchable. This trend was tolerable to me up to a point. (I've already gone on record at length in Episode 2 of the podcast regarding my opinions of how Eowyn was handled in the ROTK.) 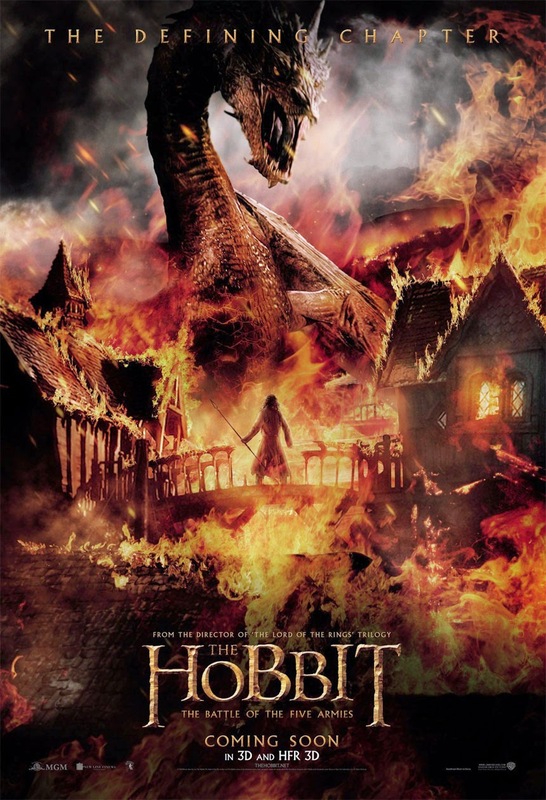 That point for me was these last 2 Hobbit movies, in which some of the most pivotal and memorable scenes from the book were cut in their entirety or were butchered beyond recognition, solely for the purposes of actor fanservice or of inserting more and more action movie set set-pieces into a story where they had no business being. Unfortunately this is not some obscure work of literature that few people have read and which no one will notice changes to. These are classics which are handed down generationally and loved in the same way. Those scenes matter. The themes matter. And from my perspective it's heartbreaking to see the property in the hands of someone who now obviously believes he knows better than Professor Tolkien how to tell a compelling story, solely because he feels he can make more money with it. The Hobbit is one of my favorite books, & I know it well. It's not that long. There is no reason to expand it into 3 movies, especially ones of that length, except to milk it for as much cash as possible, whether earned or not. There is no reason ridiculous subplots need to be inserted as they were, except to pad out screen time to make that possible. It is especially egregious and sad to me when what little of the book could have been put in those movies was cut or defiled in favor of even more ridiculous fight scenes. The business of the Arkenstone aside, I really think the Rankin Bass adaptation was a far better and true or interpretation of the original novel. And never did I ever think I would find myself thinking or saying that out loud.